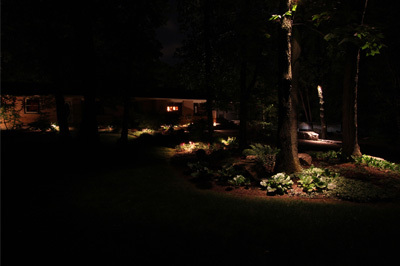 Landscape lighting design involves many different techniques to achieve an overall effect. Using the following methods, and incorporating LED and low voltage outdoor lights, Moon Glow can add dimension, texture and ambience to your outdoor living space. 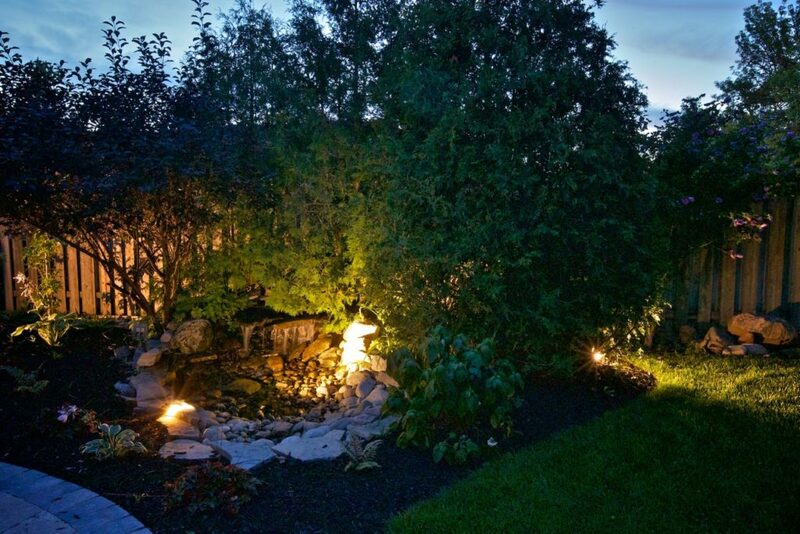 When you illuminate ponds, waterfalls or other water features, you can continue to enjoy your stunning investments well after sundown. A soft radiance emitted from an underwater fixture can enhance the effect of moving water. Shadowing includes a play of light and darkness that can be very dramatic and intriguing. We use this with statues or large trees to show off unique structural patterns. If you have a large mature tree on your lot, casting a shadow of the striking shapes created by asymmetrical branches on a nearby fence is a creative way to give your yard some evening character. Washing involves positioning the low voltage outdoor lights at the base of a flat surface, allowing the glow to softly pour over it. This technique is perfect for gently illuminating a wall or hedge. A landscape feature that is cross lit sits between two fixtures angled in a similar way. A symmetrical luminosity is created, bringing forward texture while softening and avoiding extremes. Directing a beam downwards over a plant or feature is an excellent way to draw interest toward a single focal point. This method is also commonly used over doors and entrances. Silhouetting creates contrast between a landscape feature, most commonly a tree or shrub, and an adjacent wall or structure that is lit. The plant life appears dark or black, and stands out against a bright white or background, creating a wow-factor for onlookers. This technique provides with you an effect borrowed from nature. When a fixture shines a wide beam downward from a high point, the beam diffuses as it filters through branches and other landscape features, casting a gentle shadow with a calming ambiance. Useful for both safety and aesthetics, paths and steps can be lit to direct walkers, draw attention to tripping hazards, showcase interesting walkways made of interlocking brick or natural stone and add twinkle to your evening landscape. Deck step lights create a welcoming effect that draws visitors inward. 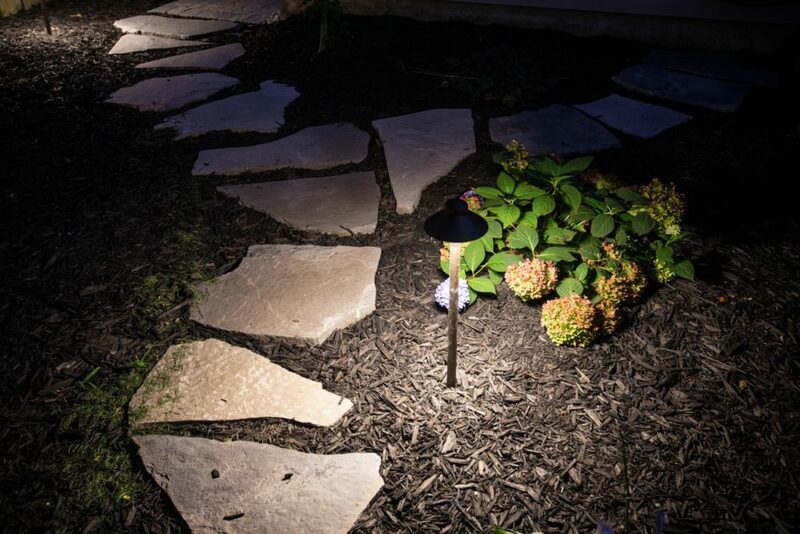 Using LED low voltage landscape lighting on the ground and angled upwards, trees, shrubs, man-made structures or pieces of art are vividly showcased during the evening hours. Beams from this angle enhance shape and texture. Depending on your desired look and feel, we can tailor this effect from intense to subdued. 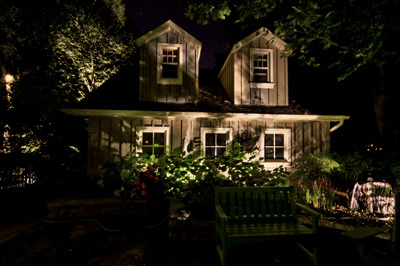 If you want to know what our landscape lighting design experts can do for you, contact us today.